At 16 years old, Kelly Needleman may be young, but he's been surrounded by artists his entire life as well as a fasctination with Italy. Integrating drones in to his film work seemed only natural to him, especially when flying around the gorgeous Tuscan countryside. Flying though Venice and the Dolomites, however, was a little trickier. Hear about the challenge of flying in those areas and about some of Kelly's favorite shots on this episode of The Drone Dish. In this episode of The Drone Dish, Tyler talks with one of the youngest guests to come on the show: Kelly Needlman. Kelly's strong photography background has led him to become more involved in filming, and using drones in his travels has been the perfect transition into filmmaking. In his work, Kelly has flown his drone around various parts of Italy and has yielded some breathtaking results. One example is his video FLYING OVER ITALY, which spans locations ranging from Tuscany to the Dolomites to Venice. 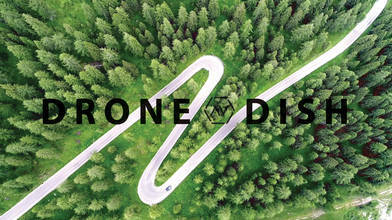 You won't want to miss this special episode of The Drone Dish! To see more of Kelly's work, check out his AirVuz profile HERE! And to watch more interviews with drone pilots from around the world, click HERE! Tyler Mason: I've got one of the youngest Drone Dish guests in history today, Kelly Needleman. Kelly, we're glad to have you on the show. Kelly Needleman: Thank you so much for having me, Tyler. I'm excited to be here. Tyler Mason: Well, we're glad you're here as well. Now, at just 16 years old, you've developed a pretty good eye for photography and videography. How did you get into those fields in the first place? Kelly Needleman: So throughout my life I've been exposed to the art world. My parents have a home interior design business and bought me my first camera when I was turning 15. My mom is an art teacher and still is creating paintings at the moment. My cousin also, David Needleman, is a professional photographer located in New York and Los Angeles. So all of this pretty much influenced me to start taking photos and videos. I was drawn to landscapes, so this started everything for me, and here I am now. Tyler Mason: And I know that you've added a drone into your work as well. It seems like a more recent thing for you. How did you decide to do that, or why do you decide to add a drone? Kelly Needleman: So for the past year, I've been transitioning myself into the film industry. I used to take a lot of images, and I've been really incorporating more film in my life. So I've been creating short films mostly in the travel category. So it was a natural progression to start incorporating drone footage. Tyler Mason: And I want to ask you about film Flying Over Italy, which was a drone video of the week nominee here at AirVuz. You got to find some pretty cool locations throughout that country. What was that experience that? Kelly Needleman: You know, it was absolutely beautiful. Tuscany was a no-brainer, because you can fly the drone easily with the openness of the vast environment. Whereas in Venice, it was hard to capture the true vibes of the city, because of the hustle and bustle of the people around me and other elements, such as birds. A couple of times, the birds almost hit my drone. I had to zigzag through the birds. It was crazy. Kelly Needleman: But as the other side, the Dolomites, was an amazing experience, because I was able to capture the majestic mountain ranges. It also got a little tricky though with the wind and fog, because at some points it's hard to see the drone. But it was definitely worth it, because I was able to capture some amazing shots. Tyler Mason: It might be hard to choose, but do you have both a favorite shot from that film and a favorite location that you flew for that? Kelly Needleman: It's pretty hard to pick, because everywhere I went was so beautiful, and I'm really grateful to see everything that I saw. But if I had to pick my favorite shot from the film, I would say it would be the road shot with the car driving through it. You know, the Dolomite roads are very windy and dense with trees. So I thought it would be a perfect aerial and abstract shot. And that was located in the Dolomites. Tyler Mason: I wanted to ask about social media. You've developed a pretty big following on a lot of different social media platforms. How important is that for a photographer and videographer to kind of use that as a tool to get your work seen? Kelly Needleman: So, you know, I've always seen social media as a great way to showcase your art and business. I've been using social media actively for around two years or so. I treat it as a business, and I'm able to attract many companies for sponsorships as well as job opportunities. So in order to be successful on social media, it is a full-time job. Like I'm on it all the time, every single day. I engage with my audience, and I always try to upload fresh and new quality content every single day. That motivates me to create new and innovative films. There are amazing videos out there from a lot of talented people in the entire world, and I think social media is a great way to share them with everybody else and maybe inspire others. Tyler Mason: A last question for you, Kelly. What's your plans for a future use of drone? I know you said you looked into getting the Mavic, but how do you see yourself using a drone in the future? Kelly Needleman: So my future plans are to create full feature movies. I like making beautiful films, and I feel it can only be enhanced by drone footage. The aerial aspect of filmmaking done well can add a tremendous element to the overall aspect of the film. I'm seeing more and more drone footage in feature films as well as in popular Netflix shows that I've been watching. So I'm looking forward to learning new aspects and effects and incorporating those aerial aspects in my future movies. Tyler Mason: Well, you're well on your way at just 16 years old. Kelly, we appreciated you on the Drone Dish today, and keep up the great work. Kelly Needleman: Thanks, Tyler. I really appreciate the support.